Held on Wednesday 25th January 2012 in the Spanish Hall, Blackpool Winter Gardens. 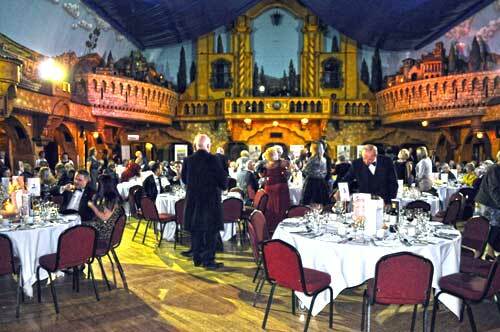 Blackpool Civic Trust held their annual award ceremony in the Winter Gardens with a dinner and guest speaker. This year was different from the past ceremonies as we moved from St John's Conference Centre across the road to the Winter Gardens. This was due to increasing numbers attending each year and this year we had a nationally famous celebrity speaker, Mr Griff Rhys Jones, who as President of the Civic Voice is a focal point in the national civic societies. Also attending were our own Patron, Jimmy Armfield CBE, several councillors, including council leader Simon Blackburn, and Civic Trust and Civic Voice members. A special vote of thanks was given to Carl Carrington, Blackpool Council's Built Heritage Manager for his support through the year and to the event. 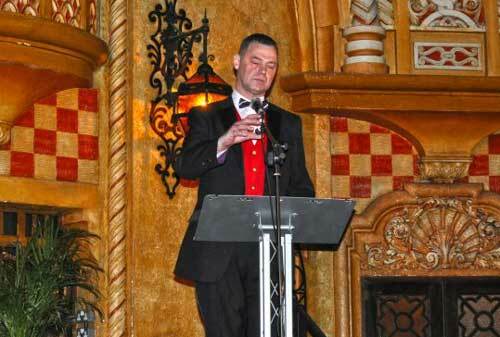 Andy Mitchell, member of Blackpool Civic Trust, the News Editor and presenter at Radio Wave, was MC for the evening. 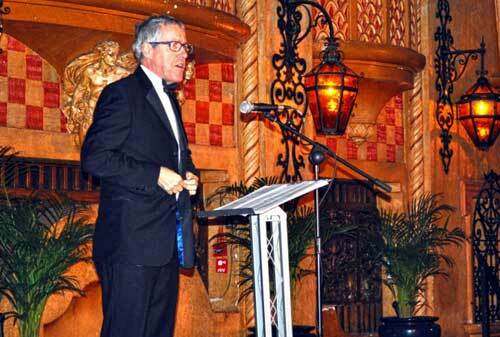 Griff Rhys Jones presented the awards and was guest speaker. 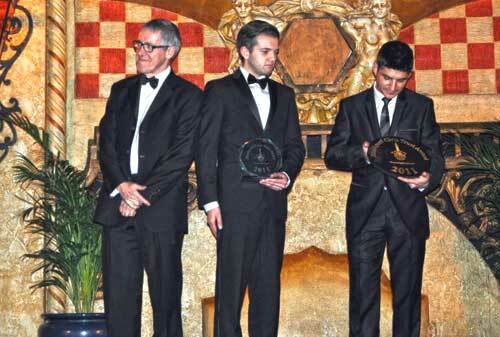 The award categories included design and construction excellence, environmental and community projects. The Environmental shields were bought to commemorate the Queen's Jubilee in 2002. Blackpool Civic Trust is a member of BEAT Ltd - the Blackpool Environmental Action Team - so each year these shields are presented to schools who helped or protected the environment. 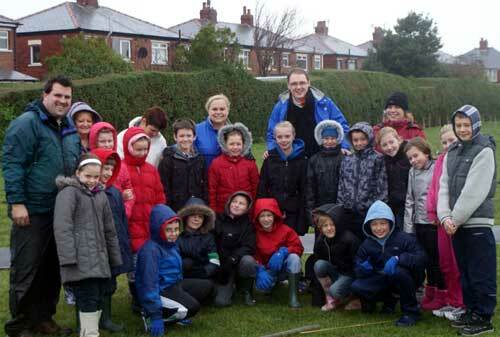 The Junior Environmental Shield: Hawes Side Primary School. Maisha Nurulmomin, William Heap, Cara Berry, Luke Livesey, Lee Black and Sophie Taylor came to the stage to collect the award. The Children played a key role in implementing year on year cuts in energy consumption leading to a 30% reduction in energy bills, a 25 % reduction in waste and substantial increases in recycling. Also creating a sensory garden, allotments and the planting of more than 500 trees - achieving Green Flag status. Also to note, they are organising and advertising the Blackpool Schools first Sustainability Conference. This will be held at Palatine High School in June. 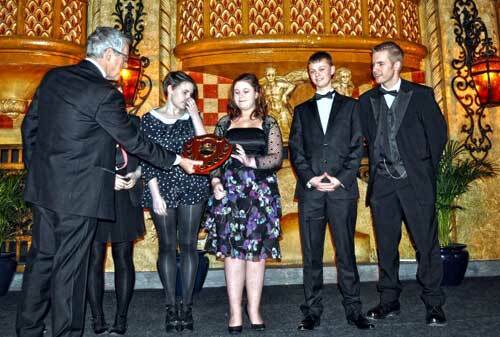 The Senior School Shield: Bispham High School & Arts College for an outstanding and inspirational Eco-Project. 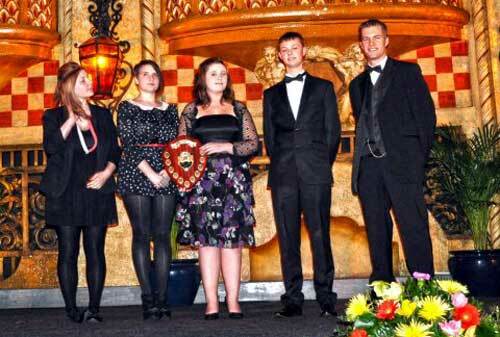 Charlotte Bendall-Dixon, Holly Bendall-Dixon, Kay Mack-Thomson, Jake Rickwood and Richard Papper collected the award. The project began with an analysis of the school's energy consumption and resulted in a campaign of awareness through posters and information throughout the school about energy saving and recycling. In addition, the project team identified an underdeveloped area of land in the school and created a diverse, well planned Eco-Garden. The Blackpool Environment Action Team Ltd Award for 2011 with Councillor Val Haynes, the Chairman of BEAT, Len Curtis MBE and other board members in attendance. 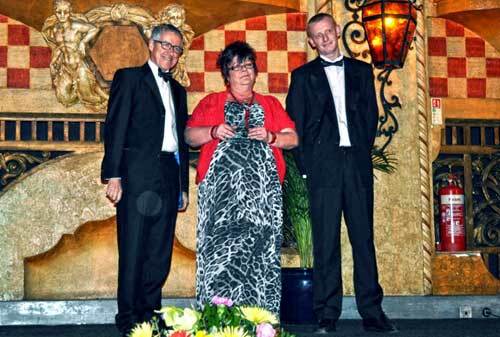 The BEAT award for 2011 goes to Maureen Horn representing the Chepstow Gardens Community Group. 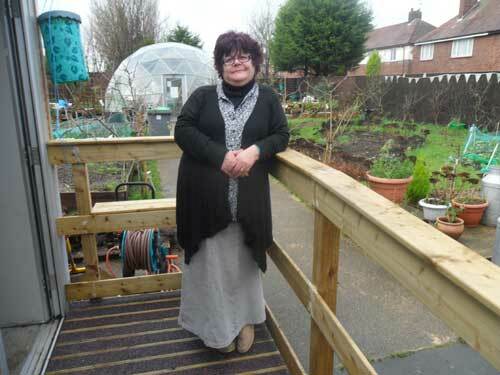 For over 15 years Maureen Horn has been working with the community in Grange Park to improve standards of lifestyle and encourage healthy eating. 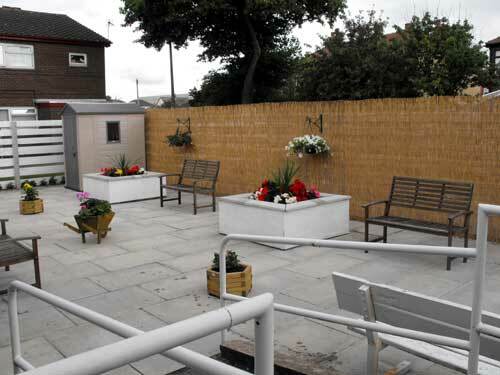 In 2007 this work was given a boost through the support of Blackpool Council and Reassurance Plus with a grant of land for the creation of a community garden. The dream came closer later that year when Maureen won funding from the Conservative Party from their Lasting Legacy fund. The local community helped clear the land and very quickly the eco-dome went up on the site which was opened by William Hague MP in October 2007. Since then the garden has continued to evolve and grow through Maureen's tireless dedication. 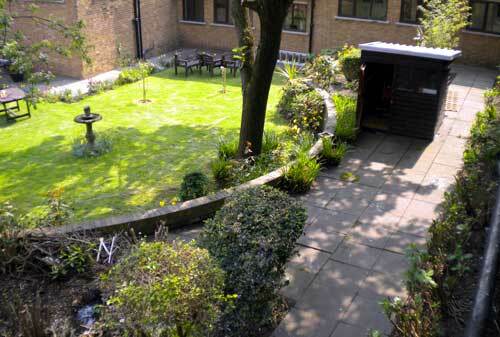 The garden now has landscaped areas, flower beds, fruit and vegetable plots and a memorial garden. This year another award has been added to the list which the Blackpool Civic Trust is pleased to be presenting, This time on behalf of Blackpool Council. This is the Blackpool Council Conservation Award and is being given to Melanie Oliver of North Western Therapies for restoration work to Springfield Road former Methodist Church. 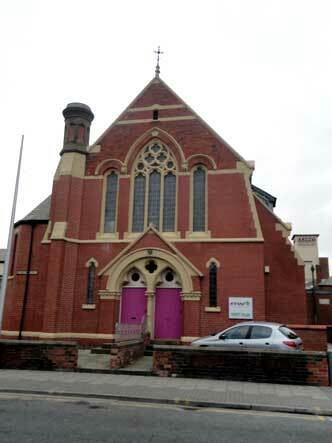 When North Western Therapies took over the former Springfield Road Methodist Church, the building was in poor condition. One of its biggest problems was severely eroded brickwork which was unsightly and was creating problems with damp. Enter stage left North Western Therapies. Almost all of the external brick skin of the building was completely replaced. This award recognises the forward looking attitude shown by North Western Therapies and the landlord of the building in dealing with an unlisted building in this way. It also recognises the superb quality of the work carried out by the contractor and the contribution this has made to the continued and future use of the building. The Community Award presented by the Blackpool Civic Trust goes to the Bostonway Residents Social Club. Janine Feeney and Amanda Jones collected the award. The Bostonway Residents Social Club is a great example of what makes residents associations so special. Its members are all actively involved in supporting each other, particularly through hardship and illness. Bostonway was nominated by Councillor, Val Haines who is the local elected member for the community. She says "This is a community area that I am very proud of. The residents really do care and look out for each other in so many ways. For example if someone is ill or in hospital, the others will always make sure there are visitors and a helping hand when it's needed. In addition, regular social activity like Bingo often involves residents from surrounding areas". This award recognises the inclusive, supportive and very much active community spirit within the Club. Well done to all of those involved. With the sea as a border on one side and Fylde and Wyre surrounding us we have to protect the bits of greenery we have left. For this reason we have an annual Open Spaces Award. 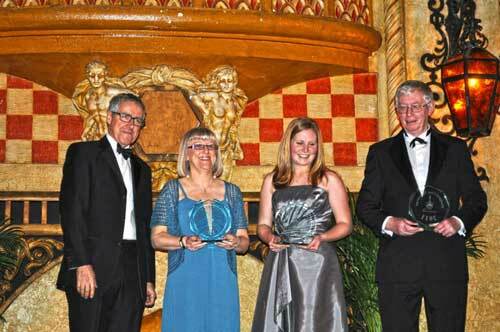 Pauline Taylor of Groundwork, Mike Sutcliffe from BEAT Naturewatch and Jenna Trewartha from the Blackpool Council Park Ranger Service collected the awards. This is another superb example of a project coming from the heart of the local community. Over a period of years local residents and members of local nature groups became increasingly concerned about the condition of a number of ponds and habitats between Hoylake Avenue and Kincraig Lake. This area contains a high concentration of ponds and other green spaces of significant local value and four Biological Heritage Sites.. In 2009 a substantial grant was received from Natural England to make the necessary improvements and raise awareness of the significance of the ponds, their scientific and local amenity value. This award recognises almost 10 years of campaigning and 2 years of hard work by a range of groups including the local community, BEAT Naturewatch, Groundwork and Natural England. 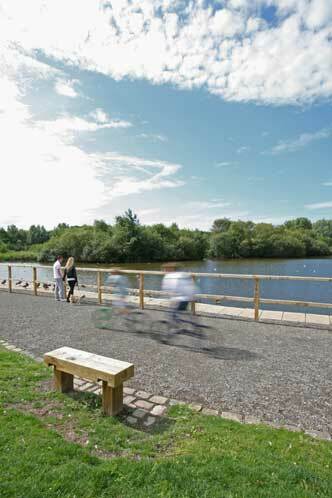 It also recognises how the project has highlighted the biodiversity of Blackpool's green spaces in a creative way that benefits the whole community. 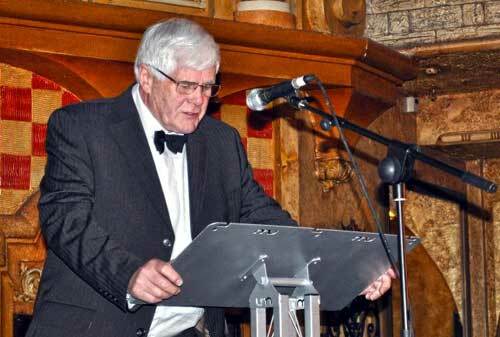 Malcolm Hankey is the Managing Director of the Civic Trust Awards and is well known within Civic Society circles. Clare Johnson from the Blackpool Council Planning Office. Matthew Jones, who is currently studying at the Blackpool Sixth Form College. Bob Taziker, the Blackpool Civic Trust Planning officer. Alistair Baines from Cassidy & Ashton Architects of Preston & Chester. There are a number of excellent nominees so we will only be showing winners in the next categories. Best Shop Front - This goes to Pizza Express on Church Street. 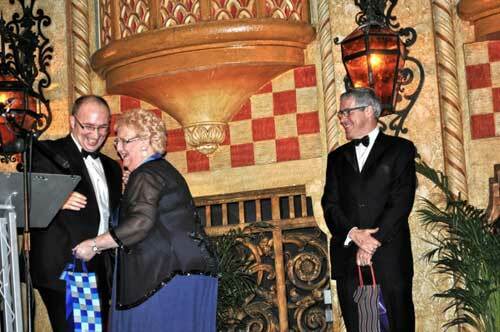 Toni Rizzuto Manager of Pizza Express Blackpool and designer Jonathan Griffiths received the award. The creative way in which the designer has used the original, simple form of the building to create a clear, branded offer has been hugely successful. Subdued external treatments with bold monochrome logos make the most of the blank faces of the building whilst large restaurant windows create a striking contrast displaying the bright, colourful interior drawing the eye inside. The fact that the panoramic windows of the restaurant allow everyone to see in, means that the shop front is partly inside as well. The fantastic murals created from images of the promenade give the restaurant a bespoke feel and the children's area - where yes, children can make pizza bases, is a great draw for families. 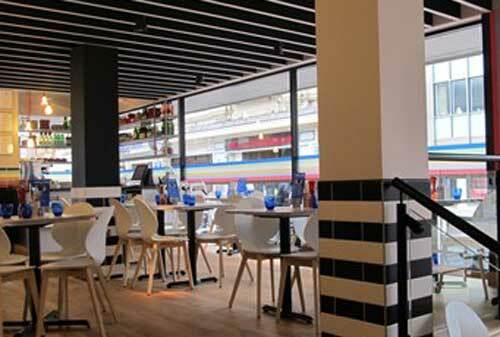 This award recognises the bold design of the restaurant and its local feel and flavour. 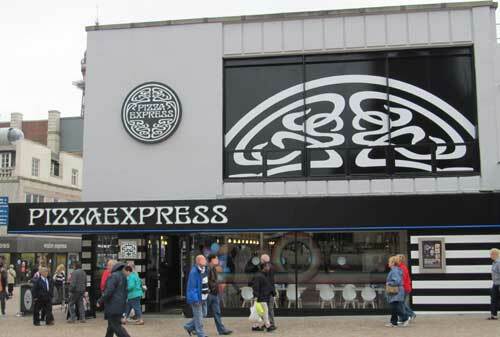 It also recognises the wide appeal of the brand and its family friendly policies - and pizza bases! Best Night Time Economy is the Sands Venue on Central Promenade. 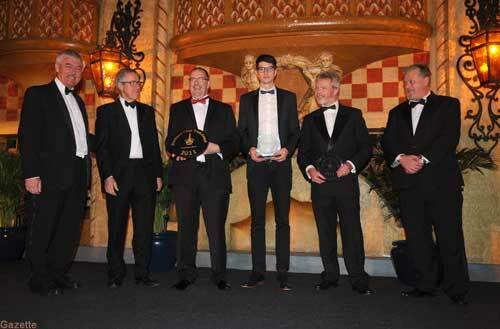 The architect Sands General Manager Lee Dumbrill, and contractor Ian Murray received the award. The re-introduction to Blackpool of the tradition of dining and dancing in a classic nightclub environment is fundamental change to the night-time economy in Blackpool. Owners Peter and Karen Swann both have a passion for music and the programming in the venue reflects this. The quality of this refurbished venue is outstanding. 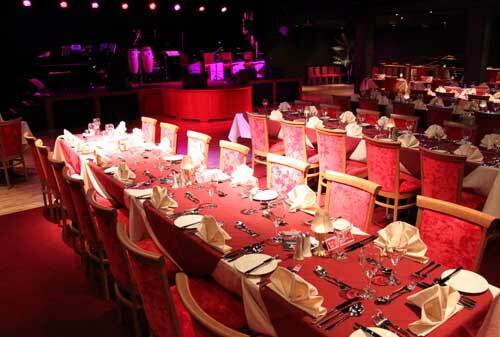 With upper and lower areas to the restaurant, a la carte and table d'hote menu's, a fantastic view from the panoramic upstairs bar and a variety of themed shows it delivers a high quality all round experience that will appeal to visitors and locals alike. 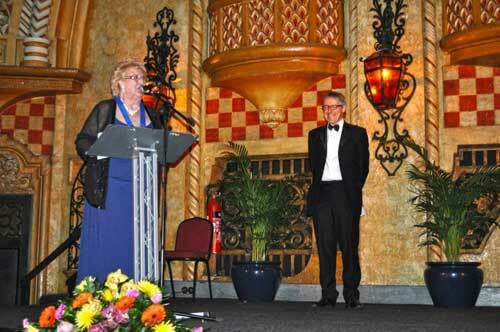 This award recognises the commitment shown by Peter and Karen Swann to investing in Blackpool at a difficult time and in bringing a quality new offer to the town. 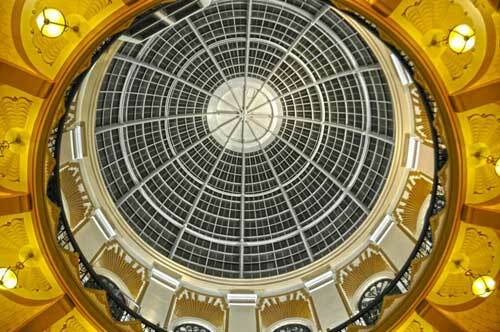 It also recognises the particular contribution of this type of offer to Blackpool's night time economy. Next we have the Award for the Best Building Refurbishment. 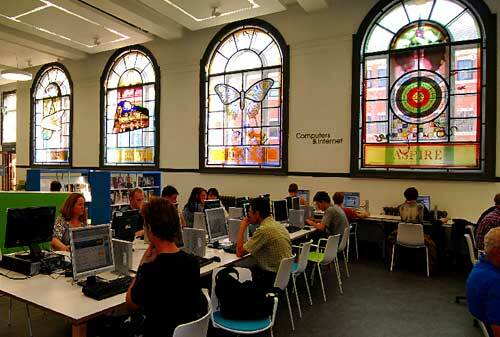 This goes to the Blackpool Central Library. 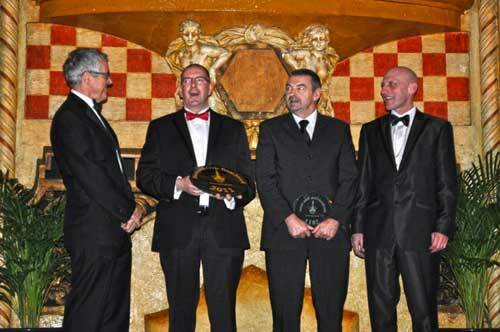 Cllr Graham Cain, Council Cabinet Member for Tourism & Culture, Adam Strudwick of the Architects Bissett Adams and Duncan Worsley and Joe Moxham for contractors Carefoot PLC collected the award. Re-inventing an Edwardian library is no mean feat, but it's one which Blackpool Library Service took on with relish and the results are really quite remarkable. Photo courtesy of Rainbow Glass. The results have transformed the experience of library users from the minute they walk through the door. Gone are the darker colours and dense shelving replaced by a light, bright contemporary interior which fits well within the listed building. Upstairs there are more flexible spaces for community use, messy artist's space and a refurbished local history section. This award recognises a clever, high quality and creative yet sensitive transformation of a grade II listed building. The architects, the staff and community stakeholders who worked with the team throughout are to be commended for their vision and commitment to delivering a library fit for the 21st Century. Cllr Graham Cain accompanied by Gordon Young from Comedy Carpet Ltd and Graphic Designer Andy Altman collected the award. A fantastic piece of public art on an incredible scale, the Comedy Carpet captures the essence of fun and the long tradition of comedy in Blackpool. The roll call of comedians is huge and features names like Arthur Askey, Morecambe and Wise, Les Dawson, Frankie Howerd and even Griff Rhys Jones! 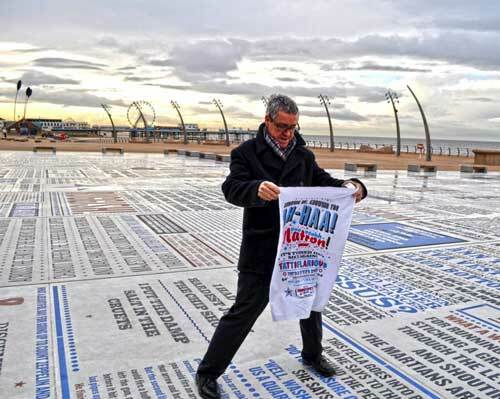 Made of thousands of individual letters cut from granite and precisely set in panels, this bright new addition to the promenade enhances the festival headland, directly to the seaward side of Blackpool Tower. One of the joys of the work is that it can be experienced in different ways dependent on where you view it from, either at ground level or from the top of the tower. This award recognises the quality, technical excellence, relevance and iconic nature of the work. It also recognises the Council's commitment to improving the promenade in such a creative and entertaining way. Next we have the best New Build. The range of projects submitted in the category for Best New Build was huge and many hard choices had to be made by the judges. However, they couldn't decide between the two finalists. Both buildings are very different - one is very big, one is very small but each were clearly winners for very different reasons. It was decided that it would only be fair to make them joint winners. So tonight we are pleased to announce that both buildings will receive the award for Best New Build 2011. Peter Whitehead,the developer, and Mike Greenwood, Andrew Mitchell and Adam Pridgeon of Radcliffe Groves Partnership. When a serious fire destroyed the iconic Belle Vue Garage on Whitegate Drive, many people thought that this was the end of the road for what had been a classic piece of Art Deco motoring heritage in Blackpool. 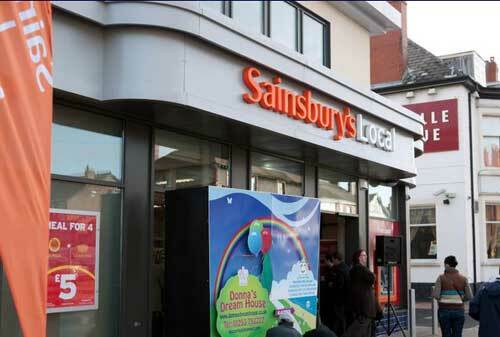 The new Sainsbury's Local store that was built on the site was designed to reflect the curved, breakfront lines of the 1930's garage canopy and whilst definitely contemporary, has a real feel of the original. This award recognises the willingness of the developer to work to a design echoing the former garage building and it recognises the tenacity of planners in holding out for a solution reflecting the history of the site. It represents the best in what can be achieved through pre-application processes and positive negotiation. Phil Lilley of LSP Developments Ltd, Jim Hart architect of West Hart Partnerships and Terry Hazelhurst of Pochin Construction Ltd collected the award. Long awaited by its local community, the Moor Park Health and Leisure Centre has delivered real change to how community services are delivered in and around Moor Park. The new centre contains a revitalised health and leisure offer, a library, health centre, cafe and pharmacy all under one roof. When considering the best new build category, judges normally make decisions based only on design and build quality. 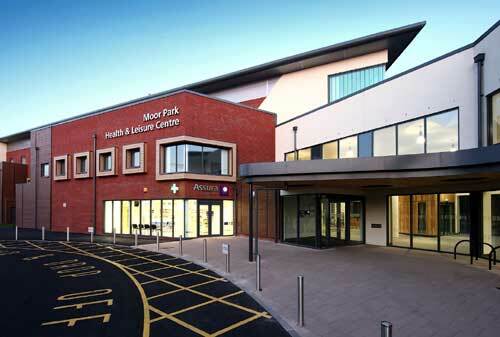 However, the reason for the inclusion of Moor Park Health and Leisure Centre was based also on the wide ranging improvement of community facilities to the local area and positive feedback from the local community. This award recognises the strength of local partnerships that allowed the delivery of such a wide range of services and providers in one location. It also recognises the commitment of the partners to making sure that provision is of the highest quality and reflects local needs and requirements. 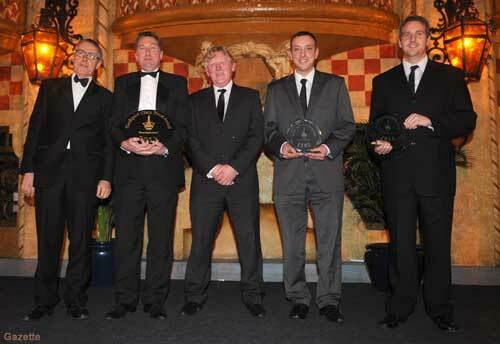 Once again the winner of this next Award has been selected by the Blackpool Civic Trust Executive Committee. This evening has shown just how much Blackpool is being transformed. This next project has been one of the most important developments for the resort in recent years and one that's been an instant hit with everyone. 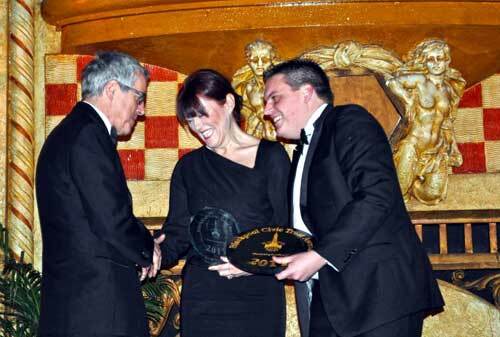 Kate Shane & Kenny Mew of Merlin Entertainments Group Ltd collected the award. When Blackpool Council signed a deal with Merlin to operate Blackpool Tower, nobody could have imagined the amazing transformation that the partnership would deliver. There were sad losses along the way, the aquarium being the most notable, but the range of amazing new attractions that have replaced them - Blackpool Tower Eye, 4D Cinema and The Blackpool Dungeon - are already proving themselves worthy replacements. But that's not all. Merlin's commitment to the public ownership model means that anyone can walk through the doors sneak a peek at the Ballroom and use the cafes and indoor facilities all for free! This award recognises Merlin's vision in its commitment to Blackpool and for delivering real and positive change within one of Britain's most iconic listed buildings. It also marks the beginning of a journey rather than the end, with plans to restore the Promenade frontage starting this year. Our last award is a special one. 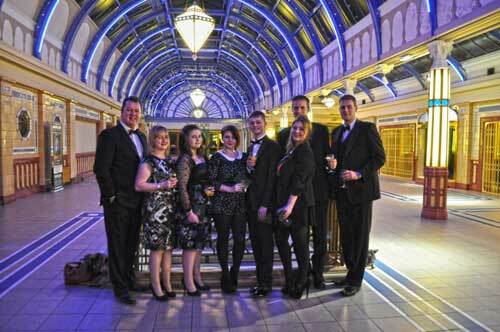 This award has no specific category and is awarded to projects, people or initiatives who show commitment to Blackpool and its people. 2011 has been a difficult year for everyone. 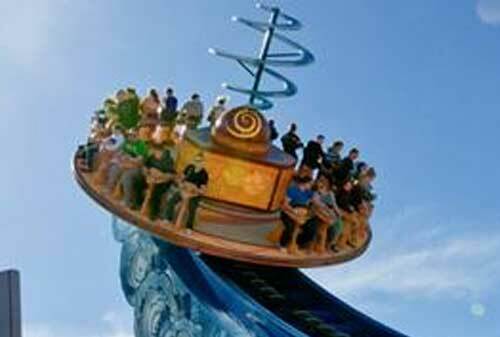 Blackpool is lucky to have a range of amazing attractions that seem to be bucking the trend. 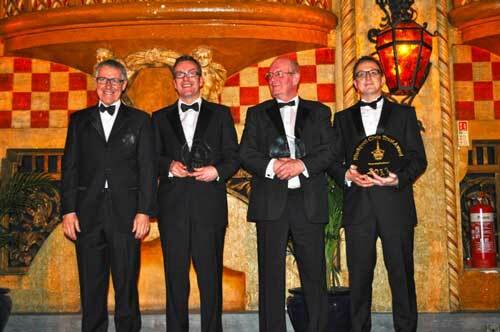 David Cam, Director and Company Secretary at Blackpool Pleasure Beach & Robert Owen, Director of Marketing, Sales and PR collected the award. The history of the Pleasure Beach, like that of the Tower, is to some degree the history of Blackpool. The constant need to change and develop to meet the tastes of each generation define all of the great Blackpool attractions. Those that cannot or will not change disappear, but those with the experience to bend with the wind of change survive. 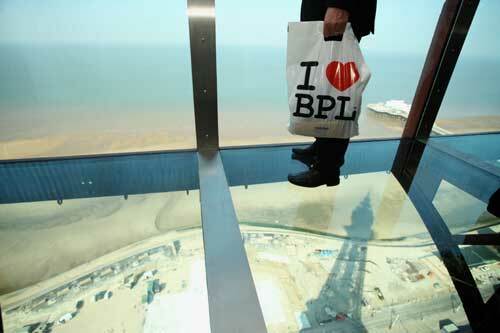 Blackpool Pleasure Beach is one of those businesses. Major investments in recent years include the Big Blue Hotel, Infusion, a major new ride and most recently Nickelodeon Land. 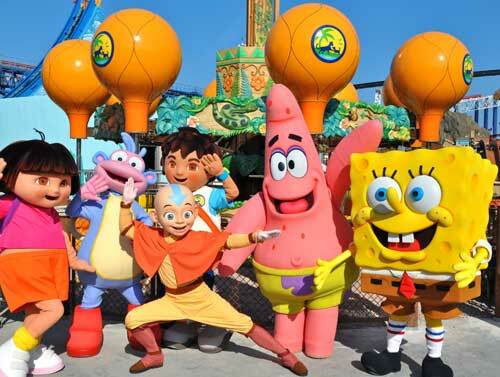 This latest investment includes 12 new rides for younger children in a special Nickleodeon themed area of the park. 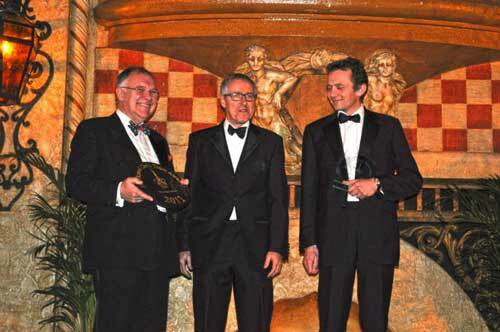 This award recognises the continuing investment of Blackpool Pleasure Beach in one of the key business offers that define the town as a resort. It also recognises the Pleasure Beach's Commitment to families with younger children and the inclusion of an international brand to the park's offer. And how often does anyone get to announce an award for Spongebob Squarepants!? One Award is not given this evening. That is the Cllr Norman & Mrs Barbara Hardy Rose bowl. Each Councillor is asked to nominate a street in his or her ward. All these streets are then judged by us and the presentation is made to the winners at our Civic Day Street Party on 23rd June. Elaine Smith thanked all those involved and gave flowers to the Mayor, Councillor Joan Greenhalgh. Carl Carrington gave flowers to Elaine Smith. The group then went for a dinner with a speech from Griff Rhys Jones and a vote of thanks from Councillor Simon Blackburn. 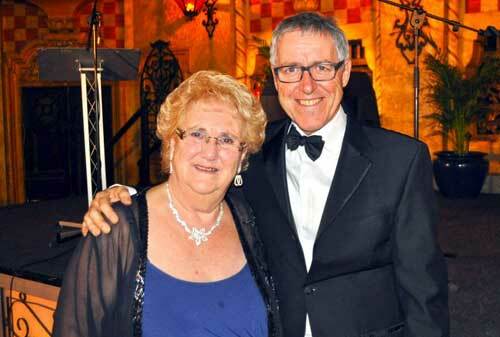 Photo of Elaine Smith, Chairman of Blackpool Civic Trust with Griff Rhys Jones. We are very grateful to FOUR of our previous award winners who all agreed to sponsor us this evening. Firstly, we have a new sponsor this year - Cassidy & Ashton architects of Preston and Chester. 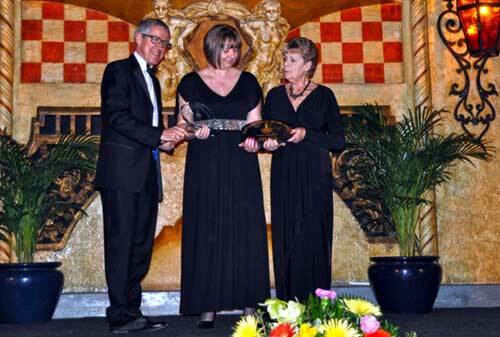 Then we have my family who won an award for the Number One Hotels in 2007 for a massive refurbishment. 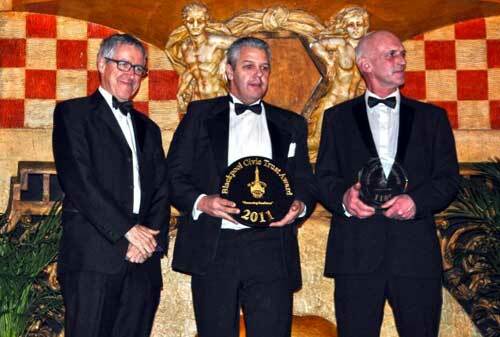 Next we have Eclipse Developments UK Ltd, building contractors who are previous award winners. Lastly, but by no means least, F. Parkinson Builders Ltd. 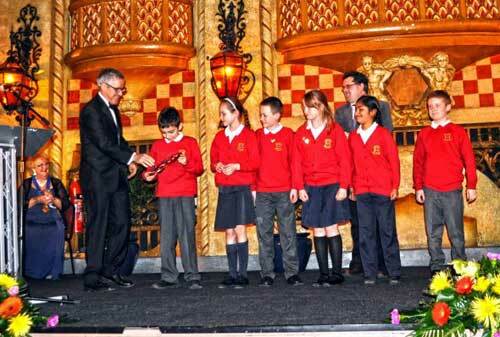 They have been associated with our awards ceremonies since the beginning. They have mainly been here as winners but like Eclipse & Number One Hotels they have sponsored us for the past three years. It is the generosity of these four firms that has helped us so much this evening and we are very, very grateful to them all. Event photographs were taken by Juliette Gregson of Blackpool Ghosts Photography who is our official photographer, unless marked otherwise. 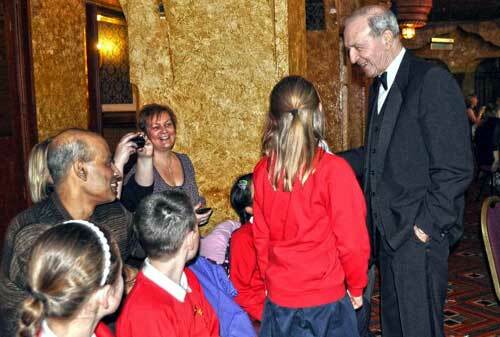 Jimmy Armfield OBE, Patron of Blackpool Civic Trust and Blackpool football legend meets the children of Hawes Side Primary School. 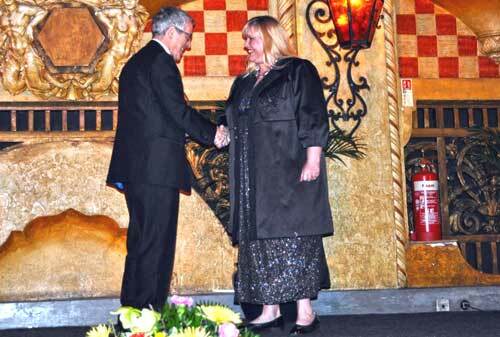 Photographs at the ceremony by Juliette Gregson, Blackpool Ghosts Photography unless marked otherwise.